Razzelcam Wedding Videographers have been creating wedding videos throughout South Wales and the UK for over 7 years. Award winning videographers Martin & Danielle have travelled the length & breadth of the UK capturing client`s special days and producing stunning wedding films. The company RazzelCam Productions was formed in 2006 and has built a reputation for exceptional wedding films, captured in an unobtrusive way. It`s not just about our films, our award winning customer service ensures that from the very first contact through to the delivery of your films, hiring RazzelCam Productions will be a decision you�ll be glad you made. 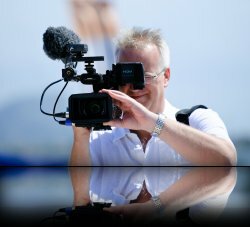 Members of the IOV (Institute of Videographers), the company has gone from strength to strength, with a reputation for exceptional wedding films and outstanding client experience…. Just take a look at our client testimonials. We use the latest High Definition cameras able to produce exceptional results, and mini microphones that capture every word without being intrusive. The films are then edited in our unique way, using both cinematic and documentary styles to create a film that will entertain make you laugh & cry. Films can be supplied on both DVD and Bluray. All of our films are edited by Martin - we never out-source editing (I believe you must have a passion for wedding editing, and not just see it as another edit job). Because of this we limit ourselves to 30 weddings each year - so to avoid disappointment please contact us to book your wedding video as early as you can.